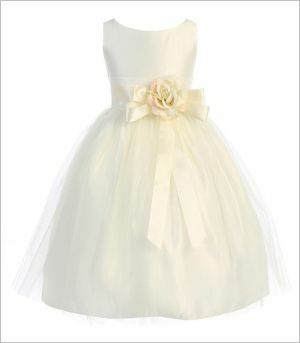 Toddler flower girl dresses are great fun to shop for. Half of it is the anticipation, knowing how excited my little girl will be to put this thing on. Wearing her dress, she feels quite as important as the bride—more important, probably; and as lovely as a princess. To her mother’s eyes, she looks lovelier than the most beautiful princess that ever was. Of course, however cute she is, the flower girl is not the focus of the wedding; so it’s important that her beautiful toddler flower girl dresses matches the wedding colors perfectly. A simple dress in appropriate colors is better than the most lovely dress in a color that just doesn’t fit with the bridesmaids or décor. What color was your little girl requested to wear for the wedding? Toddler flower girl dresses are typically available in a wide variety of colors, meant to match the wedding colors, whatever they might be. But not all colors are available for every dress, you check carefully to make sure the dress whose style you love also comes in the right colors. Since an off-shade can ruin the effect, you may even want to order long enough beforehand so that you can make exchanges in case something is wrong about the color. Is the wedding a formal affair in a cathedral, or will it take place on a beach? Is it a small celebration between close family and friends, or is half the world invited? You’ll want to know as much as you can about the style of the wedding when you go to look at toddler flower girl dresses. One lovely flower girl dress available in a wide range of color choices goes under the long title of Sweet Kids Little Girl’s Vintage Style Satin and Tulle Flower Girl Pageant Dress. Don’t mind the ugly name; it’s an elegant dress, and deserving of a better name. The dress is sleeveless, tea length, and has a ribbon and a pretty satin flower at the waist. The full skirt has a tulle overlay and a netted slip. 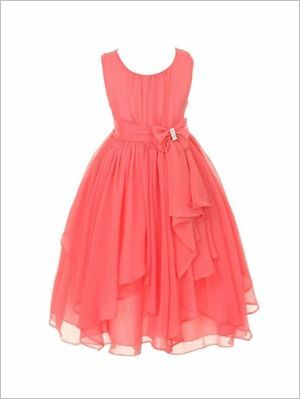 If your daughter wears a size 4 or larger, another lovely flower girl dress is the DressForLessYoryu Chiffon Asymmetric Ruffled Flower Girl Dress. This is a dress with style and beautiful lines; the asymmetrical ruffles will give a note of grace to your daughter’s every movement. As it ties with a sash you can adjust it to a perfect fit for your child; and if you ended up buying big because there are no small sizes, it will only be long, not too wide. The fabric is a bit thin; perfect, perhaps, for summer weather; but you may want to have your little girl wear a slip underneath for modesty, and if the weather is cooler a little shrug. Another dress in the same sizes is DressForLess’s Lovely V Neck Flower Girl Dress. 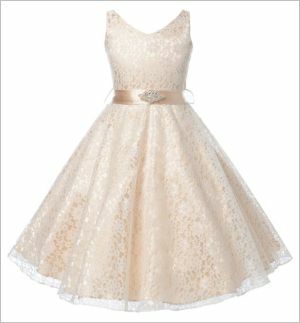 This dress is also sleeveless and tea length, but the style is slightly different than the Sweet Kids dress; the overlay is flowered lace rather than plain tulle. There’s a charmeuse sash at the waist, so this is another dress which you can adjust to fit. There are fewer color choices here, but if the options happen to match your wedding it is a dress worth looking into. If you are well prepared the big day can be a very special occasion for your little girl; take lots of pictures!